In 1932, the United States and Canada created the world's first International Peace Park by joining together Glacier National Park in Montana and Waterton Lakes National Park in Canada as Waterton-Glacier International Peace Park. The three map set of the Glacier and Water Lakes National Parks Map Pack Bundle cover the peace park in great detail. In 1932, the United States and Canada created the world&apos;s first International Peace Park by joining together Glacier National Park in Montana and Waterton Lakes National Park in Canada as Waterton-Glacier International Peace Park. 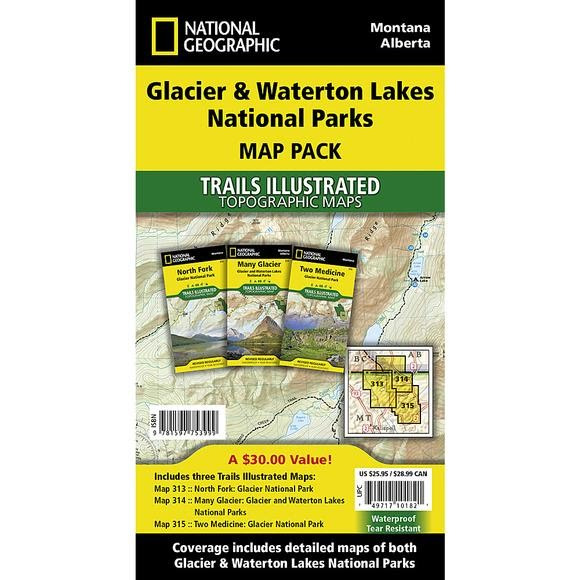 The three map set of the Glacier and Water Lakes National Parks Map Pack Bundle cover the peace park in great detail. Two of the maps cover the much larger Glacier National Park while a single detailed map covers Water Lakes National Park. All three maps show the dramatic landscapes of glacial carved valleys and peaks in great detail. The maps include snow and water hazards as well as a complete trail network with backcountry camp sites clearly shown. Measurements Each map- 37.75" x 25.5", Folded: 7.5" x 4"